Sunday March 2nd 1902 It was a cold ugly day. Will walked to town in the afternoon.I read what spare time I had. Mollie came back before supper and we talked in the evening. A year ago today at five oclock Lee died. Monday March 3rd 1902 I cleaned out the closet up stairs for Bob to go to work at he had it done by four oclock and I cleaned up things before time to get supper. I was busy about the kitchen all forenoon and Terry helped me do a big washing in the afternoon. weather cold. Tuesday March 4th 1902 I ironed in the forenoon. Will went to the sale at Hartscoks and brought a good single harness. Terry helped me wash carpet in the afternoon and churned for me. I was very tired when supper time came. 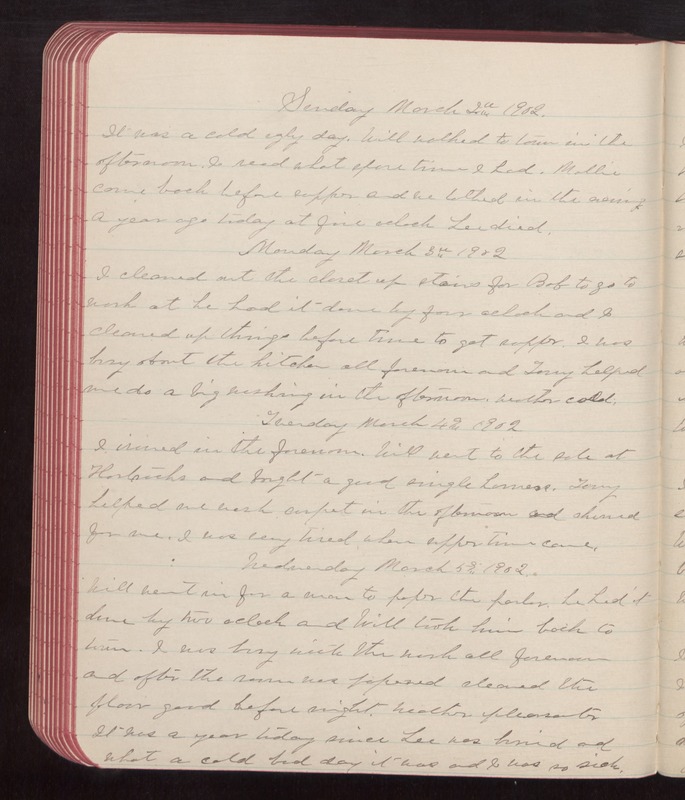 Wednesday March 5th 1902 Will went in for a man to paper the parlor. he had it done by two o'clock and Will took him back to town. I was busy with the work all forenoon and after the room was papered cleaned the floor good before night. weather pleasanter. It was a year today since Lee was buried and what a cold bad day it was and I was so sick.